Summary: During the 2008 sea turtle nesting season there were 39 hatchling disorientations and 5 adult disorientations in Manatee County due to coastal lighting problems. While lighting workshops are offered to beachfront properties each year, they are not always attended by the people who can fix light problems at a specific property. Additionally, in many coastal communities the older properties have lighting fixtures that are not always adaptable to current solutions like poly sleeves or bulb changes. Trying to meet with maintenance staff when the property is dark and problems can be pointed out is difficult since most staff don't live onsite and are not authorized for overtime to work outside business hours. This project will create an interactive CD/DVD for use by coastal property owners/managers to assess their current lighting and provide them with the resources they need to ensure their property is sea turtle friendly and compliant with local lighting ordinances. While working with properties in Manatee County during sea turtle nesting season, we frequently find that the person ultimately responsible for keeping properties compliant is not always the person who attends the FWC lighting workshops. By providing properties with a tool they can access whenever needed, we ensure that all responsible parties receive the correct information and we help eliminate the excuses that are used when violations occur. 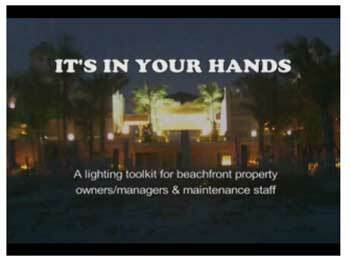 Results: 30 copies of the DVD, “It’s in Your Hands: A Lighting Toolkit for Beachfront Properties” was produced. We distributed 12 DVDs to the three island municipalities and to water front resorts-condominiums, four private water front homeowners and four businesses. One of the businesses is one of the largest water front rental agents on this island. We asked that recipients review the video and that we will contact them in the next few months for their input (after this year’s nesting season ends). Many of the condo boards will be meeting within the next two months as owners will be back for the season as well as to every future speaking engagement. We plan on presenting our program to every condo association meeting that will schedule us. We also are on the agenda in January & February to bring our program to the County & City Commissioners. I have appointments with the board members to speak to them and ask their thoughts on our DVD. We also have sent two DVDs to city officials around the state that requested them. I sent them and permission that they may reproduce them.